This savory vegetarian main dish with an easy vegan option remains a favorite recipe for treating our plant-loving family and friends at the holidays. That said, we've come a loooong way since its original publication in 2010 in providing vegetarian and vegan Thanksgiving resources. From the wildly popular Best Vegetarian Gravy to a whole Guide to Vegetarian Thanksgiving, we've got you covered. 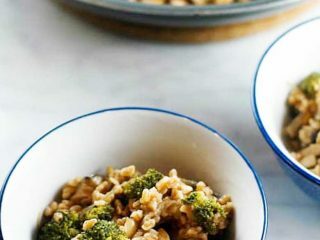 Seek out semi-pearled farro, which strikes a nice balance between nutritional content and cooking time. Some days I get a little jealous of vegetarians. They’re conscientious objectors, which confers a certain measure of instant awesomeness. They can look a pig in the eye, which I bet would come in handy more often than you’d think. Unless they eat nothing but cheese, which is what I would do as a vegetarian, they probably have excellent HDL and LDL cholesterol levels. And if they’re like Umami Boy, maybe they’ve lost 40 pounds or so since they gave up eating meat. It’s not that I’d want to be a full-grown adult with a weight in the double digits and what I can only assume would be a completely concave bust, but who doesn’t enjoy making a brazen claim of self-achievement from time to time? “I’ve lost 40 pounds!” I’m automatically jealous. On Thanksgiving, though, I’m not jealous at all. It isn’t so much the turkey flesh itself that sets my mouth a-gleek. But at your average Thanksgiving table, it’s just about everything else. Our two kinds of stuffing contain at least five kinds of meat between them. Some of the best Brussels sprouts are cooked with bacon. And what are mashed potatoes without gravy? On Thanksgiving, at least where I eat, I think it would be very hard to be vegetarian and not feel like an afterthought. Every year there seem to be one or two more vegetarians at the Thanksgiving table than the year before, so every year I spend a little early-November time thinking about meatless main dishes that pack a serious savory punch. Last year’s Acorn Squash Lasagna with Bechamel Sauce went over better than your average turkey can fly. This year, among others, I’m thinking Warm Farro with Broccoli and Shiitakes. With mushrooms, soy sauce and parmesan cheese, this is one of the meatiest meatless dishes in recent memory. You could serve it spooned into roasted squash halves for a festive presentation or add a cup or two of cooked French lentils to up the protein. Whatever you do, I think the vegetarians at your table will feel well loved. As long as the carnivores don’t get to it first. 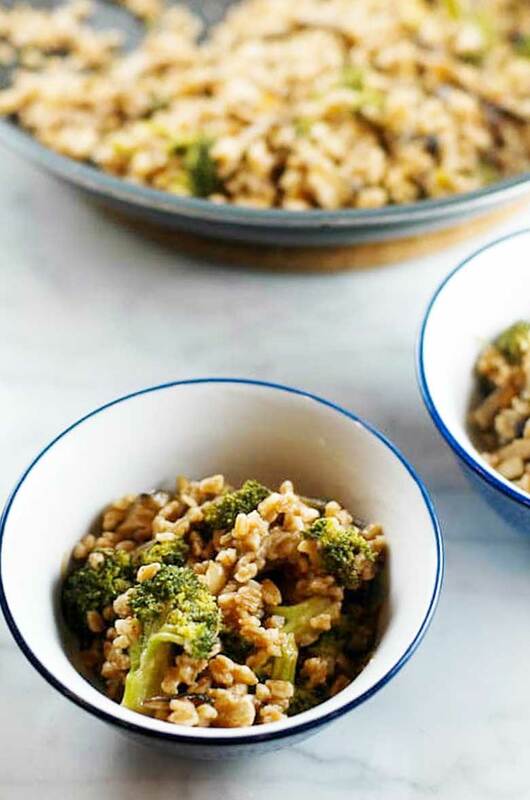 This vegetarian farro recipe makes a wonderful Thanksgiving main dish for vegetarians. You can easily make it vegan by omitting the cheese. Serves 4 as a main or 8 as a side. Place the farro in a medium pot with cold water to cover by an inch. Soak for 20 minutes. After 20 minutes, drain the soaking water and add fresh water to cover the farro by two inches. Add the salt. Bring the farro to a boil over high heat, then reduce the heat to maintain a gentle boil. Cook for about 25 minutes, until the farro is tender but still chewy. Drain. Meanwhile, heat the olive oil in a 12-inch skillet over medium-high heat. Add the onion, mushrooms and garlic and cook, stirring occasionally, until the onion is soft and the mushrooms have reduced substantially in volume, about 7 minutes. Lower the heat if necessary to prevent the onion and garlic from browning. Add the broccoli florets, soy sauce and water to the pan. Remove the lid and cook one minute more to reduce any remaining liquid to just a few tablespoons. Off the heat, add the drained farro and the parmesan cheese to the pan. Stir well and season to taste with pepper. Serve warm. Umami Girl is your guide to a life well-lived. We are a lifestyle site for curious, thoughtful women who seek to make every day a little special and have a great time doing it. We're brimming with real talk about the things that matter most — family, food, home, and adventure — and we hope you'll love digging in. Learn more. Sign up for our weekly newsletter! Umami Girl participates in affiliate programs including Amazon and RewardStyle. When we recommend products, we may earn a commission at no additional expense to you. Learn more.